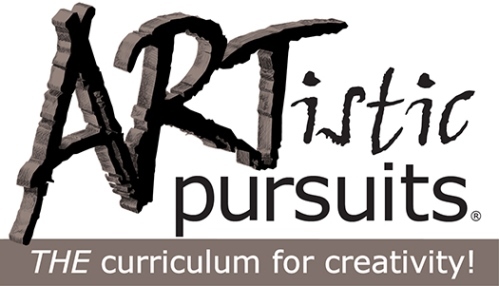 Over the years, I had reviewed all of the K-3 level art instruction books from ARTistic Pursuits, Inc., and it has become one of our favorite homeschool resources. They have recently released a new series, Art Instruction Books with DVD and Blu-Ray. I am pleased to bring you a review of Volume 3: Art of the Middle Ages. The new series is designed to introduce K-3 children to art, with Volume 1 covering the basic vocabulary and techniques of art. You can start with Volume 1 and follow history chronologically, or you can start with Volume 1 and then choose any other volume that matches the period in history you wish to study, if you're wanting art to accompany your history studies. Since we have used the other K-3 series and have been introduced to art by Brenda Ellis already, I felt like we could skip Volume 1, but young students with no art instruction would likely benefit more from starting there. We jumped into Art of the Middle Ages, because my 3rd grader was wrapping up this time period. This is a hardcover book with both text and video art instruction. Throughout this book, children are introduced to knights, monks, castles, and churches, while exploring the tumultuous time that was the Middle Ages. There are 18 projects, featuring master works in the twelve text lessons. The six video lessons feature art material instruction. My older three kids are 5, 8 and 11, so I have two that are around the target age range of this series. My 5 year old will be starting Kindergarten this fall, and she is very artistically inclined, so she was thrilled to be able to join the "big kids" for school activities. My 8 year old is finishing 3rd grade and was studying the Middle Ages, so this was a timely review for him. My 11 year old tagged along. Included in the front of the book are both a Blu-ray and a DVD, so you may choose whichever is best for you. The lessons start with a cute "art/history lesson" in period clothes, giving us a very visual glimpse at the Middle Ages. Then the videos transition to Ellis (just her hands at a table with supplies) where she walks the teacher and student through a project. My kids wanted to watch a section at a time, then do part of the project, then watch the next section, then continue the project. They found it easier than going all the way through a video and trying to go back and remember how to do something. The video lessons are spread out through the book, so you do a Video Lesson, then a few text lessons that still show master works and ask the student to examine the works and look for details. The familiar "You..." lessons, where the student does their own art based on the example, are still included. For example, when studying Lesson 3, Art in Monasteries, children are introduced to the idea of calligraphy and carpet pages and ornate initial designs, before designing their own initial with origami and construction paper. I felt that this book was a lot more "crafty" than the previous series. Perhaps because the first half of the book required paper of some sort for each lesson. We were often working with construction paper, tissue paper or origami paper. I'm not sure if the entire series is this way, or if it is most relevant to this time period, but there were a lot of paper projects. I think my kids were kind of hoping for more painting and drawing. The boys (8 and 11) tolerated the lessons, but they were able to do the work independently. I just think my 8 year old is ready to step up to the upper elementary level books as well. The five year old still needed some assistance, and even though she didn't have the history connections like her brother, she really enjoyed everything! Her favorite project is still the Crown from the first lesson, Paper Loom Weave. What little girl doesn't love making her own crown! Moving forward though, there are lessons on stitching and more weaving, and these are valuable art/handicraft skills, so I definitely want to cover them with everyone. As far as how this book compares to the 2013 edition that we have previously reviewed, there were several points of interest. I do see how video lessons can feel necessary for the more step-by-step projects, though I never felt the former curriculum was lacking in this aspect. I felt totally equipped with Brenda Ellis's written instructions to teach art without any background myself. This new book is a slim, hardback book, so it looks nice on the bookshelf, and I imagine the entire series together would look lovely. The previous series is coil bound, which was practical. The previous books have 36 lessons and were designed to each last one year. They were loosely chronological over three years, whereas the new series is divided into semesters and will cover four years of instruction. 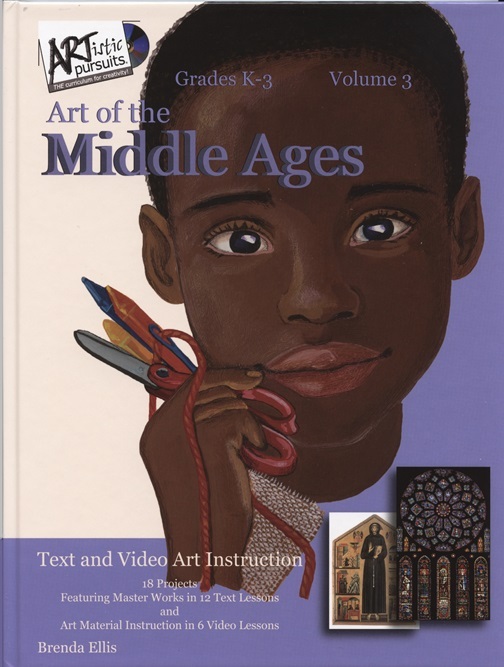 This book continues the excellent art appreciation lessons, and I think any curriculum from this company is a valuable addition to our homeschool! The Homeschool Review Crew is reviewing the first four titles in the series, but there will be eight books when the series is complete! Check out the crew reviews and ARTistic Pursuits for more information! Hi Brittney, Thank you for reviewing ARTistic Pursuits. I thought I'd let you know that Art of the Middle Ages is indeed more "crafty" than the other books because of the period where we look at tapestries, textiles, bookbinding, and painting on objects and panels. These projects build on the cutting and folding skills learned in Vol. 1. You'll find lots of painting instruction in Vol. 4 Art of the Italian Renaissance. Thank you so much for letting me know! I have a child in that time period next year, so that will work out. We have enjoyed and recommended ARTistic Pursuits for years, so I'm always ready to try new volumes!